Woodie paint a mural? We’ll bet he would. Florala is one of those places like Texarkana that straddles state lines and has a name cobbled together from both hosts. In the unlikely event you are ever asked where Florala is, you can answer “It’s just a stone’s throw from the highest elevation in Florida. 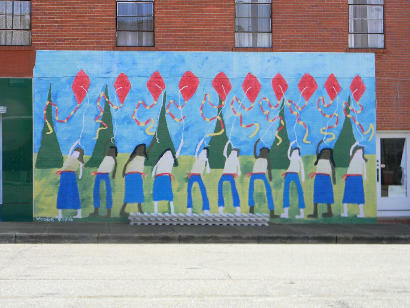 *” The two states involved here even share a Lake (Lake Jackson), but Florala’s downtown is firmly inside Alabama territory and downtown is where you will find the murals painted by the artist simply known as Woodie. World-famous naïve artist “Grandma” Moses and French painter Henri Rousseau (how do you say naïve in French?) may currently be more famous than Woodie, but that may change. Our attempts at contacting the Florala chamber met with a message recorded in that warm Alabama lilt. The simple bold colors painted on panels are starting to fade, so it was decided to make them (at least these two) the second entry in Small Town Zen. 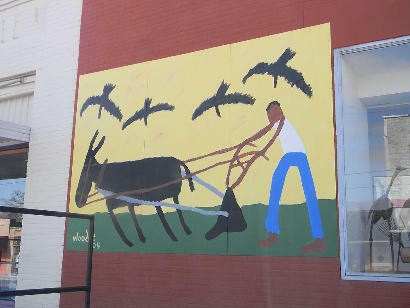 In the first mural a plowman is shown with his mule. Judging by his straight legs, the mule is giving it his all, allowing the plowman to relax his arms. Four birds fly overhead, attempting to steal seed (if the tiller man is planting), or feast on exposed insects (if the furrows are just being made ready). Or perhaps the birds are vultures waiting for the plowman to drop dead. As art, it’s open to interpretation. The second sample of Woodie’s work appears to be a synchronized kite-flying exhibition with five bowlegged Floralan boys and five Floralan girls taking part. Synchronized kite flying, although not yet an Olympic sport, is not as easy as it looks here. Easily visible from Florala’s main thoroughfare, “Kites” is installed on a building just 1,250 feet north of the Florida state line. The white fence panels are not part of the mural. Florala may be a little off the beaten path, but it’s a charming town with several interesting 19th Century buildings. One of these is the town's old bank which now houses city offices and the chamber. Florala may soon become known as the place where Woodie got his start. If anyone has information on the artist, we’d enjoy sharing it with our readers. Please send to my boss at editor@texasescapes.com with Florala, Alabama in the subject line. *Lakewood, Florida, aka Britton Hill is officially the highest elevation in Florida. 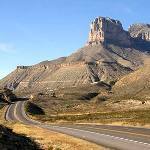 Among all of the high points in the U.S., Britton Hill is the “lowest high point” which sounds a bit like being the world’s shortest tall person.